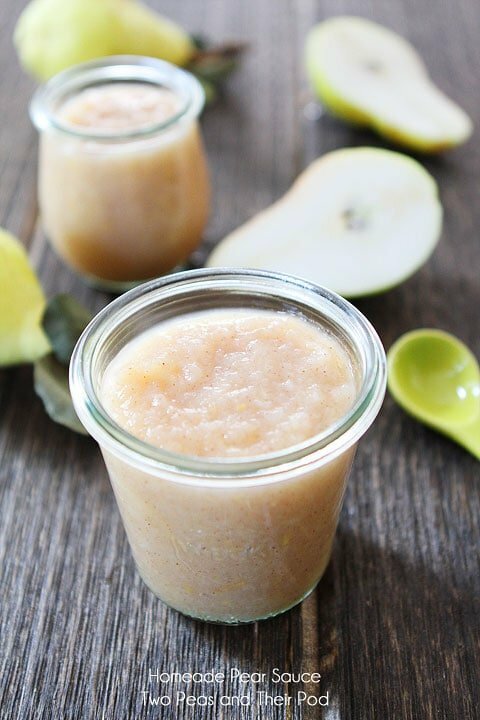 Homemade Pear Sauce is similar to applesauce, but made with fresh pears, cinnamon, ginger, and vanilla. Your house will smell amazing while this simple Pear Sauce is simmering on the stove! Our neighbors gave us a huge bag of pears from their pear tree. I accepted the bag with open arms. I love pears! I’ve already made a Pear Galette and we have been enjoying Pear, Brie, and Honey Quesadillas for lunch. I also made a batch of homemade Pear Sauce. I posted a photo on Instagram and several people asked for the recipe. 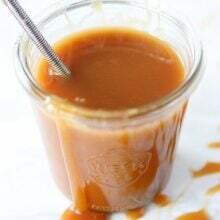 We aim to please, so today I am sharing my recipe for Easy Pear Sauce! This recipe is easy peasy and will make your house smell like fall! Pear Sauce is the best kind of potpourri. Do people still even use potpourri? Well, if you do, you don’t need to. Just put a pot of Pear Sauce on the stove and your house will smell amazing! I combine chopped pears with a little lemon juice, cinnamon, ginger , vanilla, and let the mixture simmer away on the stove. That is it! I don’t add any sugar because I don’t think it needs it. It is plenty sweet on it’s own! When the pears are soft and tender, I use our KitchenAid hand blender to puree the mixture until smooth. If you like a chunky texture, you can use a potato masher. And if you don’t have a hand blender you can transfer the mixture to a food processor or blender to puree. Just make sure the mixture cools down first. When the Pear Sauce cools down, I pour the sauce into Weck Jars and put the jars in the fridge. The sauce will keep in the fridge for about 5 days. You can also freeze or can the sauce, but we usually eat ours right up! Caleb loves eating it as a snack and so do I! I also love it on pancakes, waffles, and toast! 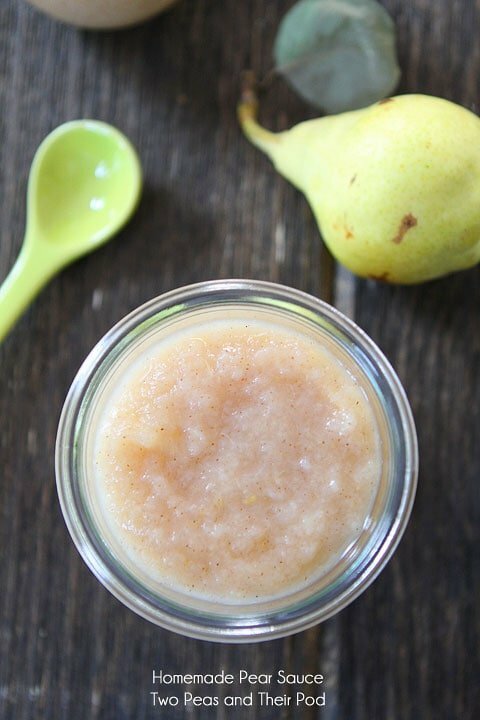 Gather up some pears and make Homemade Pear Sauce! It’s so simple and so good! We are on our last jar already which means it’s time to make another batch! Combine pears, water, lemon juice, cinnamon, ginger, and vanilla in a large saucepan. Bring to a boil over high heat. Reduce heat to medium-low and simmer, stirring occasionally, until pears have softened, about 25-30 minutes. 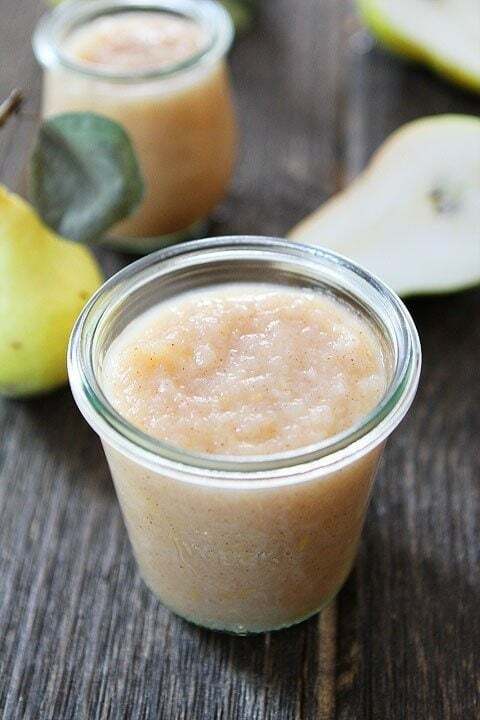 Use an immersion blender to process the pear sauce until smooth. If you prefer a chunky pear sauce, mash with a potato masher. You can also transfer the cooked pear mixture to a food processor or blender to process, just make sure the pear sauce has cooled down. Once the pear sauce has cooled down, pour into glass or plastic containers. Cover and store in the refrigerator. The pear sauce will keep in the fridge for one week. You can also freeze or can the pear sauce. Yum! I love pear sauce! It’s one of the best ways to eat pears and goes great with so many dishes! Awesome recipe and happy Friday!! 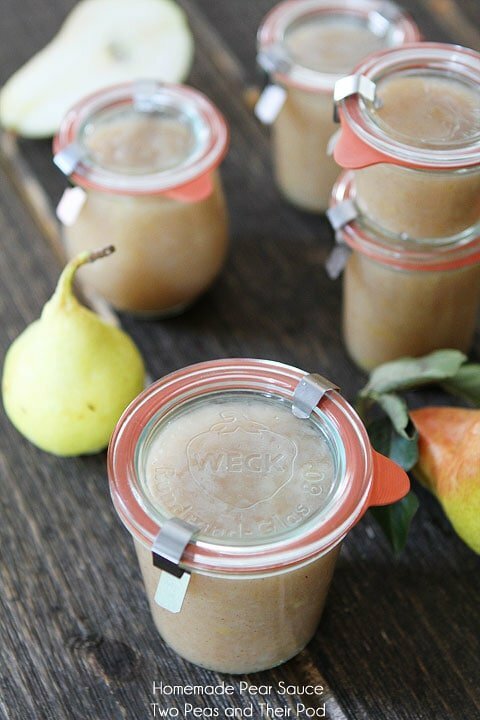 You’re so lucky to have a neighbor with a pear tree – love the idea of making your own pear sauce. I bet Caleb loved it! He’s so lucky to have a mom like you who can make such good food for him. I am not really a fan of pairs, but simmered down with cinnamon, nutmeg and vanilla? Yeah, that I think I would love! This is totally up my alley, can’t wait to make them with waffles on Sunday! Best neighbors ever. I love how good ingredients can make something so wholesome and flavorful. 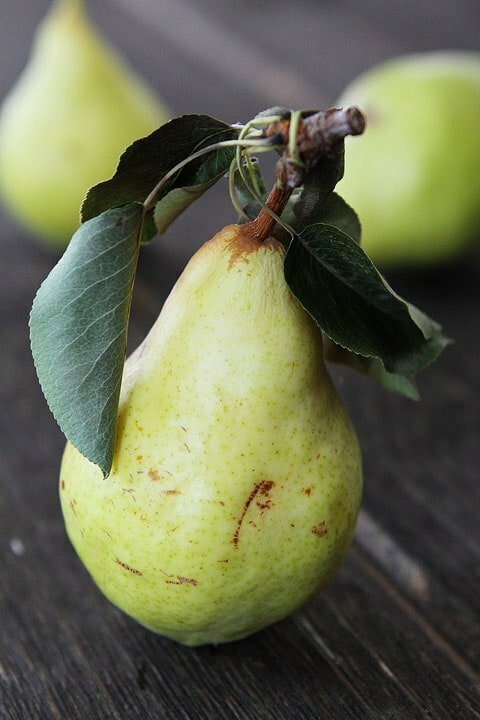 It seems like you are putting those pears to amazing, tasty use! Ooo, Pax would LOVE this. Will try soon! we have a pear tree!! I am going to go check the ripeness today!! Why have I never made pear sauce before!! Obviously this issue of mine needs to be remedied immediately! I would like to can some pear sauce- how long should I process 1 pint hard for? You have such awesome neighbors, Maria! And what a wonderful way to use up your pears! I love this so much! Big fan of applesauce so pears are right up my alley! I wish my neighbors would come over and give me some pears! haha – this is a great way to use them up!! I know what my weekend project will be. Lovely recipe, Maria! LOVE- I wish I had this when I was sitting here wondering what I would do with 40 pounds of pears 🙂 I will be printing for the next batch though. so pumped for pear season!! woot woot! Oooh, pear sauce! What a great idea! I have never had it before but it sounds delicious. This looks amazing! I adore pears too! OOh, I love pears too! This looks fantastic! I love making homemade applesauce, but have never tried it with pears. What a great idea! I can’t wait to try this — thanks so much for the inspiration! What a great idea for pears! This will be great on some Hanukkah latkes! Perfect! Have always wanted to try making this! I made a variation – I had a couple of overripe plums on hand, and I cooked them and the pears with a little lime juice with a little water. It was simple and very delicious. I haven’t made the version in the recipe posted by Two Peas, but I’ll try that next time. I made this and out in baby food pouches. Do you think this would be ok out of the fridge for a few hours? I made this today but didn’t puree the pears. They taste so delicious & yes, require no sugar! I needed much less water because my pears are so juicy. I will definitely make this again. Thank you so much for the easy recipe. Whipped this up late last evening with some old pears that had been left on the counter too long. Ran it through the foodmill when it was finished, absolutely delicious! Could you use fresh ginger instead? If so, how much? I just made this and oh my gosh, it is AMAZING!! I doubled the first batch and will be making even more soon! How would I go about canning/preserving the sause? Just a boil the full jars after? I’m borderline diabetic, so I’m always looking for low carb and low sugar recipes. I’d heard that pear sauce is better than applesauce for diabetics. Do you have any idea of how many carbs might be in a 1/2 cup serving? Thanks for any info you can provide. You have forgotten the best uses for pear sauce. Warm sauce just a little. Put over ice cream for a topping I use a kruncky ceraeal. I have a relative that is allergic to apples, so, I will make this pear sauce so she can get a homemade gift this Christmas, too. So glad to have found this recipe, sounds wonderful! I was also curious about using fresh ginger…. I always have some in my freezer and prefer to use fresh if possible…. I am sure fresh ginger would be good! Mmmm. I just made some pear sauce but I never thought to add cinnamon to it. Bet that’s GOOD! Thanks for the idea. I have a bunch of pears that never ripened. Would those work? I have some pears that are already soft. Can I just peel, core, cut, and puree them and THEN cook the pearsauce? I always leave the skin on my fruit for better nutritional value. Is it ok to leave the skins on for this recipe? Is 1/4 cup of water correct? Just wondering because I can’t really bring that to a boil in this big pot full of pears… Smells divine already and it hasn’t started cooking! Yes, if you use too much more you might end up with really runny sauce. We LOVE this sauce! We’ve made it for years when a friends’ tree is full of pears and I freeze big batches of it for my kids all for the Winter. I don’t peel the pears, which makes it much faster….just blend it all at the end and it makes a thicker, more filling sauce (the kids call it pear pudding). And I love that it doesn’t have any added sugar. Worked well for me. My first batch had difficulty processing (might have been due to a low quality food processor), so if you run into this I would recommend covering the pears while simmering, and maybe adding a little water when processing – a moister mixture should process easier. I was so glad to find a recipe with no added sugar. It’s delicious and easy. Delicious and easy! For step 3, I put the pint jars in a water bath for 15 min., so I could make it shelf stable. I have made this twice already. The pear sauce is amazing! I like that it has no sugar and very few ingredients. My house smells Fall-ish while it’s simmering. Can’t wait to try, sounds great, looks wonderful! Thanks for posting the recipe. Quick and absolutely lovely tasting! Since pear skin contains most of the fruit’s vitamins, nutrients, antioxidants & fiber, I just core the pears and leave the skins on! Then use a blender after until desired consistency. For those who are looking for exact measurements & are addicted to their kitchen scale, I have found 3 lb 12 oz of cut pears was the perfect amount for one batch. Thank you so very much for the wonderful recipe! Yum! Used 8 medium-large pears, and left skins on. Definitely doesn’t need any sugar, so sweet! Kept lid on for first half of cooking, then took off. Enjoyed consistency, used immersion blender. Easy recipe, thanks! Good spice suggestions, but ever since I made Kitchen Aid’s pear pie recipe, I can’t have pears cooked without a dash of cloves. Yep, some clove and piloncillo sugar made this Peariffic. Used about half this morning for fondue sauce with chunks of dry multigrain bread. Delicious!! I love this recipe! Especially since there is no need to add sugar. Could this recipe be made into a pie filling? All the recipes i have found call for sugar. I only need a cup of pearsauce so how many pears and how much water should I use to make a cup? I love how seat the sauce is without any added sugar! I’m putting this in my recipe box. Hello. Sounds good. Do you leave peelling on what? Can I use tinned pears rather than fresh? 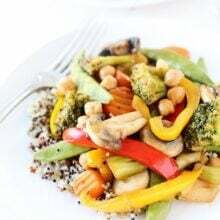 So easy and taste so good, yummy! I’m going to make pear sauce(1st time) but was wondering if I could mix it with applesauce and hot bath them? Can this pear sauce be canned in a hot water bath canner? This recipe was very easy to follow! Turned out perfect! I mixed with apple sauce and that was amazing. Do you peel your pears first? You can! It will work either way, if the skins bug you, peel them first. I have a small pear tree in my back yard. I cut most of the sucker s off last fall and the tree was just loaded. I gave a lot away but I have so many more. I would take them to the food pantry but I do not have a car. I canned 5 quarts and have no more jars. what to do with so many pears, this certainly helps. The trees have been a bit neglected but we are trying to get them all better. We do have some pears, my question is do the pears have to be ripe to make the sauce? How do you freeze pear sauce. Just put into plastic freezer bags or containers. And put in freezer? Yes, in freezer bags or containers is fine. Cant wait to eat it!! Smells amazing in the house right now. Takes forever to peal, I pealed a few then blanched the rest. pealing and cutting and coring take forEVER!!!! Was easy to make and delicious! About to make it for the 2nd time. Thanks for the great recipe! So you don’t have to peel the pears get a food mill. Just cut off stem and core the pears and then simmer on stove until soft. Put through food mill and freeze in pint containers from the dollar store. No other ingredients needed either. Yummy having some thawed pear sauce right now in March. Is the lemon juice used primarily for color? I have this on the stove as written, it does smell wonderful.